The Unthank Supper Club: The mysterious and delectable quince.. 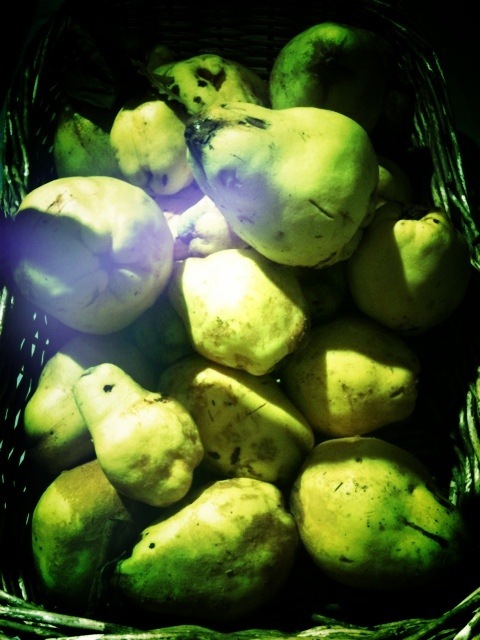 The mysterious and delectable quince..
A few weeks ago I went on my annual hunt for quince. They have always seemed the most exotic and allusive of our native fruits, and I get a bit obsessed by gathering a few when they are in season. There has been a year or so when I have failed, time or luck have been factors. This year I knocked on a few doors, a couple of beautiful old country gardens I know harbour the elusive quince tree. These are my gatherings! If you have never tasted a quince before, they are perfumed delight. The texture and flavour is like no other fruit. The hard woody uncooked fruit is inedible until poached in water and sugar. I am a purist and will not add any other flavouring such as vanilla or star anise, but one could. I love to enjoy the rare and delightfully fragrant flavour just as it comes. I will be serving them poached with rose scented ice cream, pistachio brittle and crystallised rose petals...a sort of heady Middle Eastern/English country garden treat. If there are any fruit left I will make a quince and treacle tart and maybe some Membrillo.